Sparkes proposes to write an article about modern influences on mountain people, including the Berry School, highways, automobiles, radio, etc., for the Saturday Evening Post. 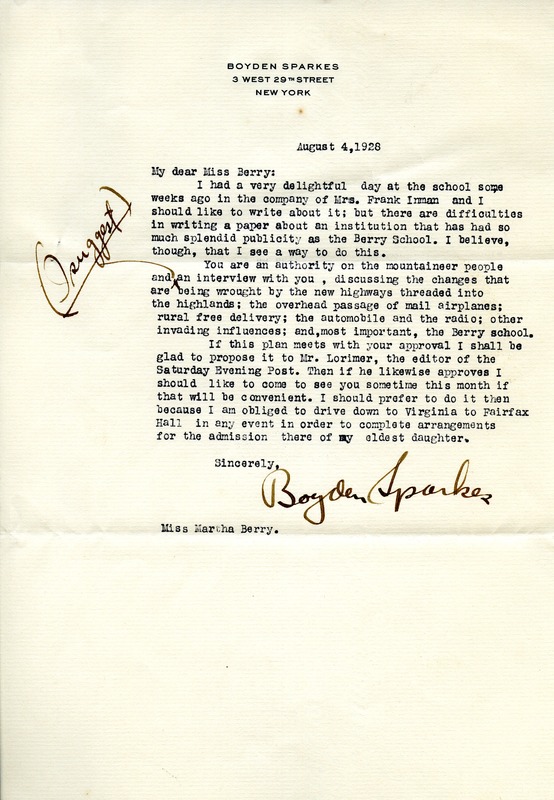 Boyden Sparkes, “Letter from Boyden Sparkes to Martha Berry.” Martha Berry Digital Archive. Eds. Schlitz, Stephanie A., Sherre Harrington, et al. Mount Berry: Berry College, 2012. accessed April 24, 2019, https://mbda.berry.edu/items/show/9008.